Any man will be happy to receive cologne from a woman, especially if she says it’s her favorite. ?It’s a scent to remember. 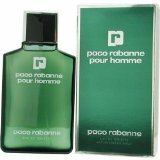 Men’s Paco Rabanne by Paco Rabanne Eau de Toilette Spray – 6.7 oz.